1. Six candidates running for the NAFA Board of Directors this year! That's more candidates than we've had in a long time. We probably won't know the results until after NAFA's annual general meeting (January 29, 2011, in Texas), but thank you to Eric Foster, Alisa Romaine, Curtis Smith, Ally Stern, Chris VanWert, and Dave Walt for stepping up this year. 2. 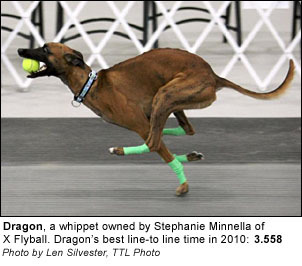 Flyball made the Guinness Book of World Records. Kudos to NAFA for organizing the world's largest flyball tournament (810 dogs competing at CanAm) and getting the Guinness folks to recognize it as a Guinness World Records achievement. Whoever came up with this idea over in Camp NAFA -- awesome. 3. New U-FLI world record of 14.864, set by Touch N Go of Las Vegas. TNG broke into the 14's in 2009, then proceeded to break their own record several times over the course of 2010. The 14.864 took place at the Fly'n Aces tournament in April, and the all-Border Staffy lineup was Chef (handled by Shelley Hovaniec), Warrant (handled by Wendy Jensen), Raptor (handled by Katy Kaylor), and Urgent (handled by Nadine Gremm). 4. New NAFA world record of 15.217, set by Spring Loaded of Michigan. Spring Loaded broke their own record (from back in 2005) at the Canine Express tournament in November, and the lineup was Butters (whippet, handled by Kelly Price), Hype (Border Staffy, handled by Heather English), Excel (Border Collie, handled by Levi Hilliker), and Mission (whippet, handled by Angie Heighton). 6. NAFA CanAm Classic tournament. Without a doubt the largest flyball tournament ever held. NAFA doesn't have a tournament summary up on their website so I'm not sure how many clubs actually entered, but with a Guinness record of 810 dogs (on Saturday, October 9th), and six color-coded rings, CanAm was a monster tournament and got rave reviews from everyone who attended. Dan Phillips' livestream video of the whole event was a really great touch, too. 7. U-FLI Tournament of Champions. Touted by U-FLI as their "biggest event to date," the tournament was held in November at the fabulous Purina Event Center in St. Louis. In addition to the championship, which had 44 clubs competing across different divisions, U-FLI also offered Dream Teams, Singles, and Pairs championships, plus the open-to-all "Meet Me in St. Louis" tournament which was held concurrently with the Championship. Hyper Flight from Texas took home the Division 1 First Place honors. 8. NAFA finally got a budget. At the August 7th board meeting, NAFA board members passed an operating budget for 2011 (NAFA's fiscal year runs from Oct 1 to Sept 30th). This marked the first time NAFA as an organization has ever had an approved budget, so good for them for making some progress in that area. Let's hope CanAm at least broke even this year! 9. NAFA's new election process. We won't know until the AGM in January 2011 whether it went without a hitch or not, but NAFA made a bold move this year by engaging an outside, web-based election service to handle the 2010 (FY2011) election. Last year NAFA caught a lot of flack for its election process, so it's nice to see that they got the message and took action. If you haven't voted yet, ballots are due in by January 27th. 10. Andy McBride's Race Tracker Web app. I loved this little app so much, I wrote about it back in March. Hail, Andy! I don't know Lyndsy very well -- we're Facebook friends and we've spoken very briefly in person at a tournament, and that's about the extent of our relationship. But she has been a flyball inspiration to me all year. The girl has been EVERYWHERE in 2010. Whenever you see a flyball photo up on Facebook, no matter which part of the country it's taken in, Lyndsy King is likely to be in it -- she's like the "Where's Waldo" of flyball. She went on a trek all over North America playing flyball at different tournaments -- she teamed up with others in Open class or on Pickup teams and got to race and train with all sorts of people. And all year she reflected back so much enthusiasm and positivity and genuine love of the sport on Facebook. Maybe I can talk her into writing a guest post here so she can tell us all about it. You guys got anything else to add to the "Best of" list? Lyndsy King is my hero. An incredible young lady, fantastic trainer and amazingly dedicated. I was lucky enough to meet Lyndsy in 2009. We had fast become Facebook friends through her incedible dog Ninja and Lyndsy's ripping wall work you tube videos. To finally meet her was fantastic. Everything she was on line, she is even more incredible in person. My life is much richer having Lyndsy in it. Lucky for us, looks like Lyndsy is planning on staying in flyball for a long time. Look for this amazing lady in the future, she is going to do great things for our sport! Great post, LisaP! #6, my rough count was 76 teams. 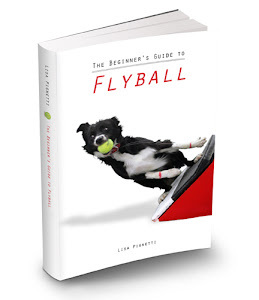 #11, flyball blogs in general. #12, Flyball Today livestreaming. In Australia/Melbourne my little rescue girl had raced for 12 months when she was put into our top team. 1st comp a PB for the team as was then our 3rd comp. So very proud of her "but it's mum that needs to do better". 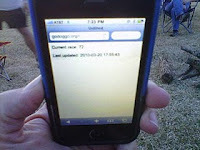 Great post Lisa P thanks for the "Flyball Sum up of 2010" Very Cool!! My best flyball momement was competeing with my at my first tournament! My second best was watching my friend's whippet return to racing after having his leg amputated from cancer! Melissa that commented about her first tournament did not only compete in her first tournament, she is FULL FORCE into flyball. In fact, if I'm not mistaken, her new Mal puppy should have been born in December.....she got bitten by the bug! She has been a non-stop helper to my team and many others! Thanks Melissa!!! So I'm wondering if Step and other Whippet owners won't mind writing a post about how they trained their sighthounds (compared to how they've trained their other dogs).